Do you know that fun is contagious? 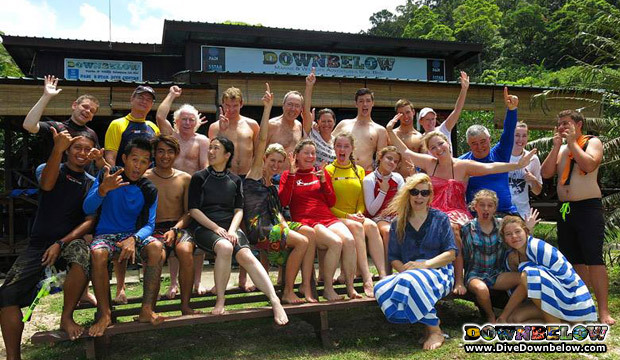 We had fun while guiding a group of fun-loving Australians who came over to our little Borneo paradise to enjoy our snorkel safari at the lovely Tunku Abdul Rahman Park Borneo. Snorkeling is one of the activities that we offer for non-divers and is one of the easiest, most fun and most popular ways to see the underwater world and very inexpensive. If you have never snorkelled before but would like to try, do not worry. When you snorkel with us, our guide will familiarize you with the snorkeling equipment and access your snorkeling experience to ascertain the safest and most interesting places to take you snorkeling. This ensures our safety standards are adhered to and fun will be had by all. Aboard one of our fast, comfortable and spacious speedboats the Downbelow Snorkel Safari offers flexibility to visit some of the best snorkel sites in the marine park but also enjoy Gaya Island. Our qualified snorkel guides will assess the conditions on the day and choose the best islands and location to suit the environment. You will begin with an orientation session at one of the island beaches, spending the morning jumping from the boat onto sites otherwise not accessible. You will find yourselves enthralled and mesmerized by the sights. Just ask these aussies!